Track your cash sales and manage your cash drawer with the Square Point of Sale app on an iPad or Android tablet. Note: Employees must have the Change Settings and Manage & Open Cash Drawers permissions enabled for their role in order to start/end cash drawer sessions. Note: Cash drawer management isn’t available on smartphones. View Square app features by mobile device. Tap Settings > Cash Management > toggle the switch next to Cash Management on. Enter your default starting cash amount and select your report delivery preferences. After you start a cash drawer session, you’ll see basic information on the current session, including starting cash amount, cash sales, cash refunds, cash paid in/out and the expected cash amount in the drawer. From your in-app menu, tap Reports > Current Drawer. Tap Starting Cash to enter the starting cash amount in your drawer. Tap Start Drawer > Confirm Start Drawer. Enter an optional drawer description. Go back to your Register to start accepting sales. With Cash Management enabled, you can also start a new drawer session by entering a sale and tapping Charge. When the Start Drawer prompt appears, enter your starting cash amount > tap Start Drawer. Add a drawer description to help identify your cash drawer during a session. Tap Drawer Description and enter a description. With the Paid In/Out feature, you can record deposits and withdrawals from your cash drawer. Cash paid in and out appears in the drawer history on the iPad, with both the description you enter and the total amount in the drawer. Enter the cash amount and a description. Tap Paid In if you add cash, or Paid Out if you remove cash from the drawer. Tap Confirm Paid In or Confirm Paid Out. 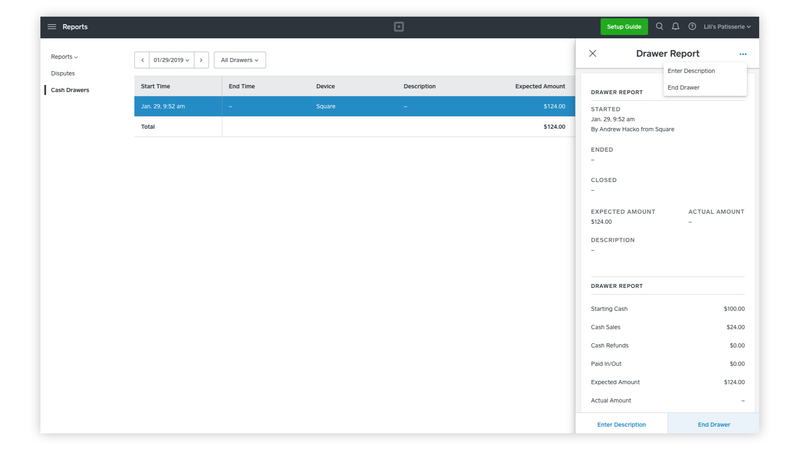 In addition to closing a cash drawer from the Square app, you can close any open cash drawers from your online Square Dashboard. Enter the total amount in the drawer, or keep this field blank. Tap End Drawer > Confirm End Drawer. Head to your online Square Dashboard > Reports. Click the Cash Drawers tab > Drawer Report. On the drawer report details, you’ll see the option to End Drawer. Enter the actual amount and drawer description. If you want to grant a manager or employee access to manage cash drawers online, just make sure to update their permissions from the Employees section of your online Square Dashboard. You’ll need to grant them permission to View and Manage Cash Drawers, under the Access Dashboard section. Keep in mind: You will not be able to pay in/out when you end a drawer remotely. You can opt to have a cash drawer report automatically sent to your email address when you end your drawer. From your in-app menu, tap Settings > Cash Management. Enter in your preferred email address. Keep in mind: Cash drawer reports are device specific. If you have multiple devices with cash drawers, you’ll need to run a report of each one separately. You are not required to enter in your primary Square email address. If you’d prefer, you can use an alternate email address to receive this report. Keep in mind Cash Drawer reporting is specific to the device connected to the Cash Drawer. Tap Reports > Drawer History. Tap the drawer you’d like to review. To email the report, tap the envelope icon. If your device is connected to a supported receipt printer, you’ll also see the option to print your cash drawer report. 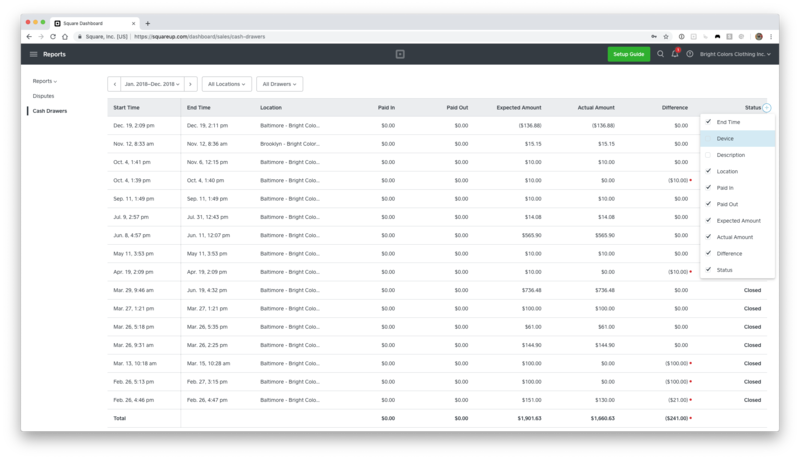 Visit Reports > Cash Drawers in your online Square Dashboard. Click the date selector tool to set the dates you’d like to view. Click a drawer session from the list to view details. Add columns to view details like Paid In/Out, Device, and Location. Note: Cash drawer reports can’t be downloaded or exported from your online Dashboard at this time. If this permission is not enabled, an employee won’t have access to the information above. Note: The permission “View Expected Amount In Cash Drawer” does not apply to auto-emailed cash drawer reports. Visit Employees in your online Square Dashboard and click Permission Groups. Click a permission group and check or uncheck the box next to View Expected Amount In Cash Drawer. Note: Employee Management must be enabled from the Square app on your iPad to use this feature.